Without question, fog is the biggest reason sailors cite for avoiding the Maine coast in summer, despite the fact that it is otherwise an excellent cruising ground. Although sailing in Maine can indeed be quite opaque, this need not be too disconcerting. Instead of being mindlessly fog-phobic, it is better to view fog, wherever you meet it, as just another navigational puzzle to be solved. No matter what others say about the dangers of combining fog with inflexible schedules, skippers will still sail off into thick pea soup, common sense be damned. Someone’s timetable inevitably “forces” a cruise through the grey wilderness. Many may vow “never again,” but they do it again anyway, so I will spare you my own advice about never venturing out if visibility is less than a quarter of a mile. Instead, I will tell you this: all fog ends. And it gets thinner. Exactly when and how depends a lot on what kind of fog you have in the first place. To live with and conquer fog, you must understand what it is and know how to cope with it. Audio cues like crashing surf, boat engines, barking dogs and sea birds can be just as important when sailing in fog as the bells, gongs and whistles on navigation aids. Sometimes they are more important. In any case, your hearing can often be much more useful than your eyesight when fog gets really thick. So the first rule is this: use your engine as a last resort. Like blinding headlights on a dark road at night, your engine impairs your hearing not only while it’s running, but also for several minutes after you shut it off. Even if you post a lookout on the bow, well away from the engine, its drone can make it hard to pick out the first sounds of an approaching powerboat, crashing surf or other important features in the aural landscape. So use your sails first and foremost; leave the auxiliary for dead calms. When you do motor, shut down the engine at frequent intervals and listen closely to the world around you. Remember, too, that some points of sail are better for hearing danger than others. In general, sailing upwind in fog is safer than sailing downwind. Sailing upwind, sound is carried to you; sailing downwind, it is carried away. And, of course, a moderate breeze will carry sounds farther than a light one. The thickness of fog can also affect whether you hear things sooner rather than later. 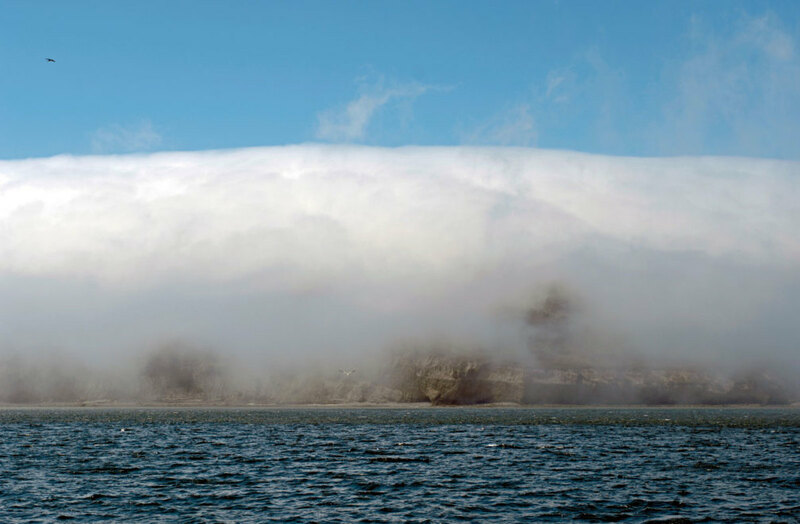 In 100 feet of visibility or less, only the loudest foghorns are of much value, and even their locations can be hard to pinpoint as sounds can literally bounce off fog banks of varying thicknesses. Sounds may disappear and reappear. You should never assume you are going to hear an audible navigation signal as you approach it. When visibility falls to near zero, it is best not to plot a course for a harbor that has a narrow entrance or lots of traffic. Outside of Maine, harbors like this are less common, but east of Casco Bay, it’s easy to find mile-wide estuaries leading to harbors rarely visited by most pleasure boats. Fortunately, traffic is easier to avoid in these days of inexpensive GPS devices. 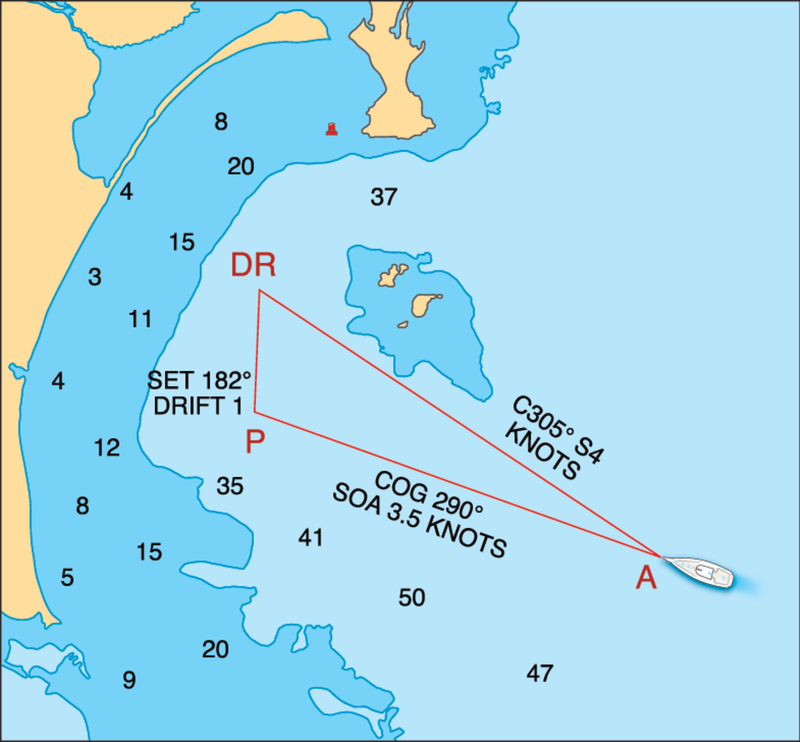 Before GPS, most skippers plotted the same courses to the same buoys, thereby increasing the risk of collision. Today you can create your own waypoints and stay well away from those popular courses and buoys. It may take a little more time, but the pay-off is a safer, less traffic-filled passage. Courses plotted to the lee side of islands tend to work out well because the warmth of the land thins the fog and may accelerate the summer sea breeze. Courses that take you well inland are also helpful, as the air here warms up more quickly and disperses fog sooner. The upper reaches of many rivers often provide excellent sailing while those sailing farther downriver are left grumbling in the soup. The best way to avoid collisions in fog is to make noise. Always carry a powerful handheld signaling horn and know how to use it. Even if you don’t always follow the rule about sounding a signal every two minutes while underway in fog (one long blast for power vessels; one long and two short blasts for vessels under sail), you should be prepared to when you know there’s traffic around. If you hear a boat approaching in fog and determine there is a risk of collision, the appropriate response is five short blasts on a horn. Short blasts are defined as one second each, but I’ve found slightly longer blasts work much better. Radar, of course, is a very useful collision-avoidance tool, but remember not all vessels will show up on your radar screen. Fiberglass sailboats and small skiffs can be hard to detect, as are kayaks, which are increasingly common in the waters where I sail. 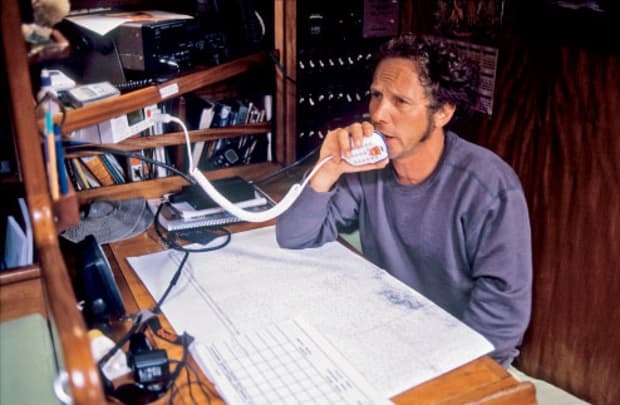 Another useful way to make more noise is to use your VHF radio. Make periodic sécurité calls on channel 16 announcing your position, course, speed and intended destination. Most importantly, when visibility is very poor you should slow down. Maintaining a modest pace is the most prudent approach to fog. That and the other tips outlined here have kept me from banging into anything in the 35 years I’ve cruised the Maine coast. 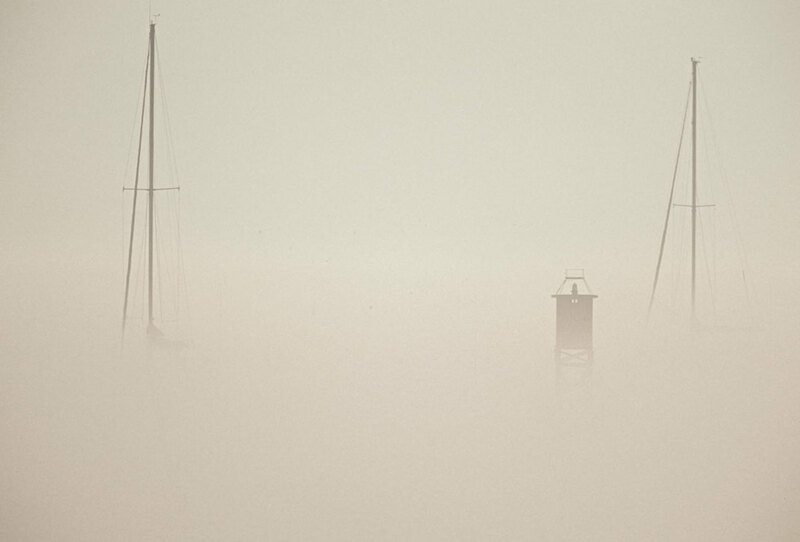 Sailing in fog without electronics is definitely challenging, but is far from impossible. I cruised aboard a 31-foot engineless sailboat for three years with no navigation electronics and never once banged into anything on the foggy Maine coast. always know where you are. This means plotting a running fix on a chart at least every 15 minutes. To do this you need to keep a close record of courses steered, for how long and at what speed so you can constantly engage in some old-fashioned dead reckoning. Most importantly, you’ll need to factor in tidal currents. The best way to determine their direction and strength is to maneuver your boat so as to remain stationary next to a buoy, then check the speed and heading you must maintain to stem the current. With practice, you can gauge current accurately watching it flow by buoys and other fixed objects. Armed with this information, you can then figure in a vector for current set and drift when plotting your positions. A depth sounder (or a lead line, if you are truly running without electronics) can be a very useful tool. When closing a shoreline, soundings often provide very reliable evidence of how far off you are. You can also sail safely along a shoreline by following a depth contour line on your chart. This works best when you follow a line that is fairly smooth without too many kinks and turns in it. Contour lines on steeply shelving bottoms are also more distinct and easier to follow than lines on gradually sloping bottoms. The best way to follow a line is to zigzag a bit so you keep crossing and recrossing it. Using this technique, it can be relatively easy to follow the coast to a point where you can get a visual bearing that proves useful in entering a harbor. Tactically, when sailing blind you usually need to navigate a series of routes between fixed identifiable objects so as to repeatedly confirm your position. Noisy offshore buoys are the safest targets, followed by noisy offshore lighthouses. Don’t be immediately concerned if a target buoy doesn’t show up exactly on time. Precise boat speeds, in particular, can be hard to pin down and current vectors may shift without you noticing. Stay loose and listen carefully all the time. Meteorologists recognize fourdistinct types of fog. Knowing what type is present can help you cope with it more effectively. Also known as sea fog, this is the most common type. It’s formed when warm, moist air passes over cold water. The cold causes the moisture to condense, forming tiny water droplets suspended in the air. Sea fog appears most often during the summer, especially at night and during the morning. It is thickest when the wind is light and tends to thin as the sun shines brighter and winds pick up in the afternoon. Also called ground fog, this usually forms at night and in the early morning when the air is still and the sky clear. In these conditions, air near the surface cools more rapidly than the air aloft. If the air is cooled enough, the moisture it contains will condense and form fog. Radiation fog doesn’t usually last long. The warmth of the rising sun and/or a breeze of more than 5 knots usually disperses it by mid-morning. Also known as “rain fog,” this occurs when rain from warm upper air layers descends through colder air near the water’s surface. Water vapor from the descending raindrops condenses and forms fog. It can occur most any time of the year with winds southwest through east. When the rain stops, the fog usually lifts, especially if the wind keeps blowing. Commonly called sea smoke, this is caused by very cold air passing over markedly warmer waters. It generally occurs in winter, but can form in the late summer and the autumn. It behaves much like steam rising from a hot bathtub, obscuring visibility at or near the surface of the water. Increasing wind tends to dissipate it, as does the warmth of the midday sun.